In my last post (that you can read here), I shared that my husband and I were trying to get out of debt and that I had become an Independent Consultant for Jamberry as a way to help pay off our debt faster. 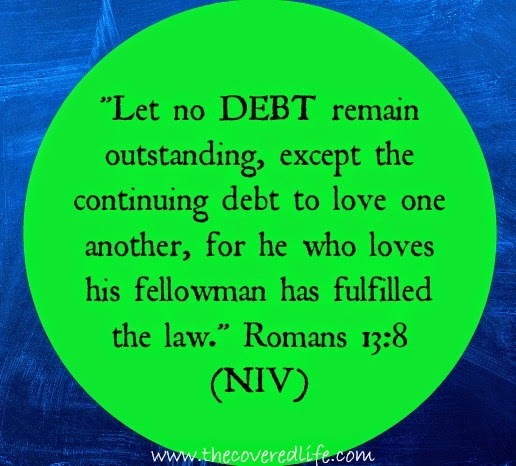 Now I'm going to share with you why we want to be debt free. First though, I want to make clear, that I am not speaking negatively about borrowing money or saying that at times it isn't necessary. There are people who pay for cars and houses and all sorts of large items in cash. I think that is AWESOME, but I don't think it is realistic for my husband and I. Here is our reality: We have credit card debt, and 2 car payments. We are currently renting a house, but we hope to buy or build a house within the next five to ten years. We have looked at houses and dreamed, but when we realistically look at mortgage payments in light of our income and spending currently, we just can't swing it. But, if we could remove the hundreds of dollars we pay each month to credit card and car payments we would easily be able to make a mortgage payment! However, we don't only want to be debt free for a house, but also because it would free us up to give more. We believe completely that tithing a portion of what God has blessed us with back to him is a way we honor and worship him. And we also give monthly to other areas, sponsorships and programs as well as special offerings above what we tithe. BUT, we would still love to give more. We would love to be so financially free that we could sponsor numerous children from Uganda, and sponsor multiple mission trips and missionaries, and just be able to do more to further the Gospel and glorify God. So those are our main reasons. Are we planning to buy our house in cash- No! So I realize that there will be debt again. But our goal is to get control of all the "snowballs", eliminate some and manage them better in the future! I think Dave Ramsey has a great philosophy. But we aren't looking to be incredibly wealthy- you can't take a cent with you when you leave this earth! We do, however, realize the importance of living within our means and giving to others. And in Part 3, I'll share with you some of the tips and things we have been doing to save money. Some, just may surprise you and some, may make you wonder why you didn't know about it in the first place! And please feel free to share your success stories with me, I'd love to hear them!